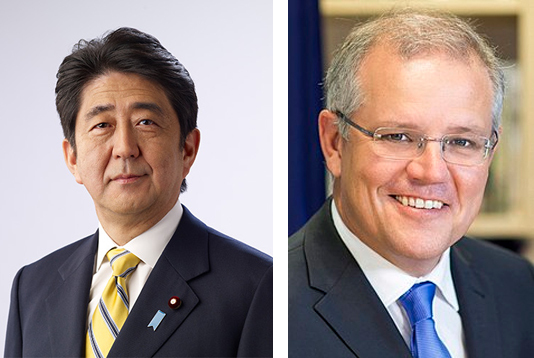 Japanese Prime Minister Shinzo Abe and Australian premier Scott Morrison on Sunday congratulated Sheikh Hasina for her reelection as the Bangladesh Prime Minister for the fourth term. “One behalf of the government and the people of Japan, I would like to extend my warm congratulations on your Excellency’s (Sheikh Hasina’s) assumption of the forth term in office.” Shinzo Abe said in a congratulatory letter. Abe said he is convinced that Sheikh Hasina will continue to lead the path of democratic and economic development in Bangladesh, and Japan will continuously support to her government. “I am very pleased that our bilateral relationship has dramatically developed under the ‘Comprehensive Partnership’,” he added. The Japanese premier commended highly the efforts of the Bangladesh government to provide shelter to a large number of displaced Rohingya people of Rakhine State. “I am looking forward to working actively with Sheikh Hasina to additionally fortify the respective relationship and for stability and peace in the region,” he said. In his congratulatory letter, Australian Prime Minister Scott Morrison termed Bangladesh a valued partner in the Indian Ocean region. “We will continue to work with Bangladesh to support the growth and stability and address our shared interests, including on increasing trade and investment, countering violent extremism, promoting human rights and addressing the Rohingya crisis,” Morrison added. Chairman of ‘Council Ministers’ of Bosnia and Herzegovina Dr Denis Zvizdic also congratulated Prime Minister Sheikh Hasina today. “I am confident that extremely well-friendly relations between Bosnia and Herzegovina and the People’s Republic of Bangladesh, would, with your support, continue to strengthen and deepen for the benefit of our peoples and citizens,” he said.